Consider inviting Lisa Kivirist and/or John D. Ivanko to present a keynote or plenary, or faciliate a workshop related to one of the many themes explored in Homemade for Sale, Soil Sisters, ECOpreneuring, Farmstead Chef, Rural Renaissance or Edible Earth as well as themes reflected in John's six multicultural children's books. Kivirist and Ivanko welcome opportunities to work with conference planners or workshop review committees to devise the most appropriate and engaging presentation for those in attendence. Included among the speakers on EcoSpeakers.com (John or Lisa), American Entertainment Speakers International (AEI), BME Global, we have given numerous talks about a wide range of topics at such venues as the National Farmers Union Conference, Wisconsin Book Festival, SolFest, Midwest Renewable Energy Association's Renewable Energy and Sustainable Living Fair, St. Petersburg Festival of Reading, MOSES Organic Farming Conference, Green Festivals, The International Ecotourism Conference, Wisconsin Association of Public Libraries Annual Conference (Dells, WI), Go Green Expo (Los Angeles, CA), PASA's Organic Farming Conference, Living Green Expo (Minneapolis, MN), SolWest (John Day, OR), I-Renew's Energy Expo (IA), Wisconsin Governor's Conference on Tourism, Midwest Environmental Educators Conference (IA), Minnesota Tourism Conference, National Audubon Society Conference, Isthmus Green Day, Living Lightly Conference (Michigan Friends; Chelsea, MI), Penn State Green Design Conference, Kickapoo Country Fair (LaFarge, WI), EcoFarm, Fermentation Fest (Reedsburg, WI), Pennsylvania Environmental Congress, Gathering Waters' Land Stewardship Conference, and the Midwest Birding Symposium, among many others. Kivirist and Ivanko have made presentations at numerous universities and colleges including George Washington University, Penn State, South Dakota State University, and Southwest Minnesota State University. They have also presented at numerous libraries, bookstores, community festivals and for organizational meetings for non-profit organizations. Presentation topics range from launching a food business from your home kitchen to living more sustainably, from diversifying on-farm income to sharing your farm story with public relations efforts, from powering your home/business with renewable energy to becoming a farmstead chef, and from operating an award-winning ecotourism destination to eating organically on a dime. They draw from their local -- and global -- experiences, often complimented by John's professional photography. View a speaker demo tape of Lisa Kivirst's presentations with John Ivanko. To determine availability, contact Lisa Kivirist or John Ivanko at (608) 329-7056, john (at) innserendipity (dot) com, or write to W7843 County Rd. P, Browntown WI 53522. Presenter(s) speaker fee, travel, lodging and meal expenses are flexible, depending on the venue, audience, time of year and travel distance. Either Lisa or John, or both together, can make the presentations, depending on the needs of the conference planners. Learn how you can start a simple food business from home with little to no investment while doing the things you love: baking, canning, pickling and more! Jump-start your freedom to earn by taking advantage of state laws that allow specific, "nonhazardous" foods to be made in your kitchen and sold to the public. You can join a growing movement of entrepreneurs starting small food businesses from home. No capital needed, just good recipes, enthusiasm and commitment, plus enough know-how to turn fresh ingredients into sought-after treats for your local community. Managing liability, risk and government regulations. What's the key ingredient to healthy communities? Women leading food system change. Women make up one of the fastest growing segments of new farmers today. They come from a long and deep history and tradition of cultivating the soil. This fresh crop of women farmers are finding innovative ways to champion local agriculture and foster greater collaboration and cooperation. Collectively, they improve the health of our environment, stimulate the economy, build a greater sense of community, and nurture a more vibrant food system. What does our future hold and how can we support more women taking on leadership roles to change what's on our plate? 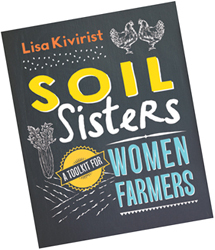 Come celebrate the historic roots and inspiring stories of women farmers today -- and in the future -- with Lisa Kivirist, author of the new book Soil Sisters: A Toolkit for Women Farmers. How do we eat healthy, save money and steward the planet for generations to come? Join a national movement of people returning to our nation's farmstead roots of independence, self-sufficiency and frugality, blended with the spice of modern living and a passion for transforming our planet. Whether you're a dedicated urbanite or rural dweller, join this delicious presentation (samples from the author's cookbook, Farmstead Chef, may be shared) and discover simple tips for homegrown and homemade cooking, from preserving the harvest to stocking the pantry to building local community around your kitchen table. 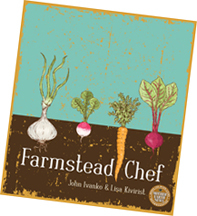 Join Lisa Kivirist and/or John Ivanko as they share simple ideas, a few recipes from Farmstead Chef, and their seasoned experience from running their family's farm and bed & breakfast, Inn Serendipity, outside Monroe, Wisconsin. Go carbon negative and (largely) fossil fuel free with renewable energy, organic and local foods and green home design. Garner ideas and inspiration to simplify and achieve greater self-reliance with a nourishing, meaningful livelihood that enriches your quality of life. This lively and engaging timeline presentation captures Lisa Kivirist and John Ivanko's journey, presented using a clothesline. It's inspired by the presenters books: HOMEMADE FOR SALE, ECOPRENEURING, FARMSTEAD CHEF and RURAL RENAISSANCE. Tired of driving to a job to pay the bills while your heart is on the farm? Looking to move to a rural area but not sure how to make it financially viable? Come for ideas and strategic inspiration for generating income on your farm by creating multiple farm-based small enterprises that can thrive in a rural area. From bed & breakfasts to freelance writing and teaching workshops, from making value-added products in your home kitchen under "cottage food" laws to completely running the farm on renewable energy, find untapped income sources that work synergistically with your passion for farm living. The workshop covers idea development, business planning, managing expenses, creative frugality and eliminating debt, family/relationship balance and seasonal income diversification. Workshop based on HOMEMADE FOR SALE, ECOpreneuring and Rural Renaissance books. 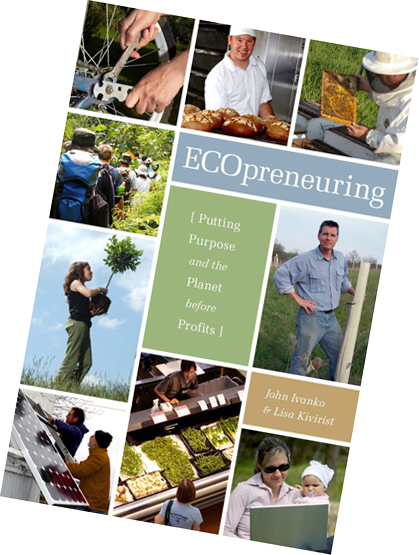 Examine how small, sustainable, and place-based businesses and the ecopreneurs who run them are becoming the very foundation of the emerging new green economy of the 21st Century. Drawing from over a decade of first-hand experiences as well as interviews of other rural entrepreneurs for the non-profit organization, Renewing the Countryside, Ivanko and Kivirist will delve into the practical aspects of what it means to be an ecopreneur and small business proprietor, and what it means to the health and well-being of your community. Examples feature ways businesses can be more green, how to green existing nature-based businesses (such as ecotourism enterprises), and the many benefits of being a more sustainably managed business, including becoming more profitable. leveraging the Internet to collapse the "friction of distance"
capturing the growing trend of creativity-based livelihoods, as evidenced in such best-selling books as Free Agent Nation, Creative Class and Cultural Creatives. Whether you want to go off grid or supply it with renewable energy and make energy a positive cash flow for your business or homestead, explore your many options to power up with renewable energy. Explore wind, solar electric, solar thermal, geothermal, wood heating and other aspects of sustainable living. Inspired by the RURAL RENAISSANCE book. One family's love for summer squash, solar energy and serendipity. Journey to Inn Serendipity, a farmstead in southwestern Wisconsin where a wind turbine spins, gardens bloom and love and laughter fuel one family's quest for the good life. Join award-winning authors and innkeepers Lisa Kivirist and John Ivanko as they narrate the engaging and inspiring story of their family's journey back to the land, living and learning amongst the strawberries and ladybugs. A department store goliath says you can shop for the good life. Someclaim the good life comes only in retirement. Co-authors Kivirist and Ivanko disagree. The good life is not about the goods of life, or waiting until you're retired to do what you love to do and live according to your values. It's about a more self-reliant, simple, and ecologically mindful lifestyle that's merged with a more meaningful livelihood that supports a living, restorative and local economy. restoring the health of our community, on which our own healthdepends. Learn about what steps can be taken -- big or small -- that celebrate the most basic of all American rights: life, liberty and the pursuit of happiness. Download the powerpoint presentation made at the Wisconsin Governor's Conference on Tourism, March, 2005 (requires Adobe Acrobat Reader for viewing). Download the powerpoint presentation made at the Upper Midwest Organic Farming Conference, February, 2005, and other venues (requires Adobe Acrobat Reader for viewing). As the organic and “know your farmer” market grows, opportunity abounds for farms to creatively diversify to bring in extra income. Get ideas on hot-growth categories such as pizza night, farm stays, processing under cottage food law, commercial kitchen set-up and winter CSAs. It's inspired by the presenters books: HOMEMADE FOR SALE, ECOPRENEURING, FARMSTEAD CHEF and RURAL RENAISSANCE. Solutions to social or ecological problems can sometimes be found in our backyards – or at the end of a country lane or on the menu of a local cafe. Evidence of a preservationist movement can be found in the explosive growth of farmers’ markets, farm-to-table restaurants, agri-tourism operations and a diversity of other sustainable farming and rural enterprises that seek not only to preserve the sense of place where they’re based, but often restore the soil, improve the watershed and create a more viable and resilient local economy. The list of possibilities to economically steward our communities and landscape grows wide and deep, but embracing these options demand foresight and a deep commitment to blending direct, engaging experiences with sustainability. By providing ways to directly connect with and preserve our heritage and rich sense of place, we both create financially solid enterprises while ushering in the next generation who, in various ways, sow seeds that preserve the very sense of place we treasure. This century is the "Century of the Small," says Paul Hawken, author of The Ecology of Commerce. Small businesses, small towns and small cars. Join John and Lisa to examine how this transformation is already taking place in a community near you and how you can join what is quickly becoming one of the most widespread -- albeit silent -- grassroots movements in decades. Whether you're among the 25-percent of working Americans who have started their own small business or free-lancing enterprise or the swelling ranks of home-based do-it-yourselfers who have downscaled consumption and upscaled their satisfaction with life with their family, spouse or community, small is beautiful, sustainable, economically viable, and more spiritually fulfilling. Ivanko and Kivirist will share how. Download the powerpoint presentation made at the Wisconsin Department of Tourism Marketing Meeting, December 8, 2005 (requires Adobe Acrobat Reader for viewing). Download the powerpoint presentation that addresses enrichment travel, ecotourism and agritourism made at the Wisconsin Governor's Conference on Tourism, March 14, 2006 (requires Adobe Acrobat Reader for viewing). 7.2 MB file. 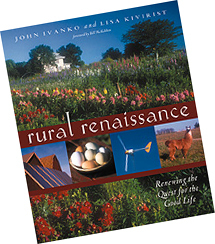 Since arriving in WIsconsin over a decade ago, authors Lisa Kivirist and John Ivanko have shared Wisconsin's stories of restoration, renewal, and revitalization. Living their story, the couple launched their own enterprise, Inn Serendipity, completely powered by the wind and sun. Whether serving as lead writers for Renewing the Countryside: WISCONSIN or capturing the transformative changes underway in their acclaimed books Rural Renaissance and ECOpreneuring, this duo will reveal how Wisconsin is at the forefront of our nation's emerging restoration ECOnomy. In these times of change, global awareness based on understanding, respecting and celebrating diversity is essential to successfully sharing our common home, Earth. 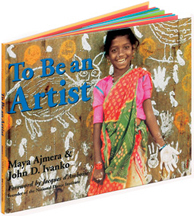 Since 1996, the Global Fund for Children (GFC) has created books and resource guides for young readers that help expand their appreciation of the multicultural world in which they live; sales of these books support the grant-making work of GFC. For example, Ser Vecinos, the Spanish version of GFC Books' award-winning book Be My Neighbor that includes words of wisdom by Fred Rogers, celebrates the many different ways children live in a community with others. Kirkus Review described it as "a visually enticing tribute to diversity and the number of bonds that unite us in a common humanity". In 2008 alone, the GFC has disbursed 541 grants worth $3.16 million to grassroots children's programs around the world. Join co-author John Ivanko as he shares how libraries can showcase cultural diversity and build bridges to far away places based on his work with GFC. 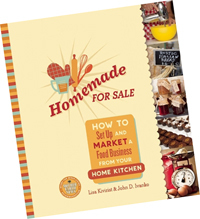 Order your copy of Homemade for Sale, Farmstead Chef, ECOpreneuring, Rural Renaissance or John's children's books (a PDF file order form).